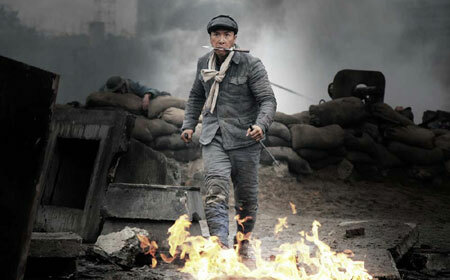 Donnie Yen as Chen Zhen in Legend of the Fist: The Return of Chen Zhen. Serviceable action and a fine production make Legend of the Fist decent popcorn fodder. However, director Andrew Lau eschews real storytelling in favor of empty style, needless flash and lazy screenwriting that should disappoint just about anyone who likes quality with their motion pictures. Great for audiences who want to see Donnie Yen beat up lots of people but bad for everyone else. Superficially, they’re quite a team-up. Reigning martial arts superstar Donnie Yen and ballyhooed Infernal Affairs co-director Andrew Lau join forces for the anticipated martial arts actioner Legend of the Fist: The Return of Chen Zhen, which presents a brand new chapter in the legend of righteous martial arts hero Chen Zhen. The character is a particularly storied one, having been played by both Bruce Lee and Jet Li, as well as by Yen himself in the Fist of Fury nineties TV drama. The spin this time is that Chen Zhen survived after exacting vengeance on the Japanese who murdered his master Huo Yuanjia (a.k.a. that Fearless guy) and, after a stint fighting Germans, he went on to become a masked superhero dedicated to fighting the Japanese. Again. Chen Zhen: he fights injustice, as long as it isn’t Chinese. Just as quickly as he earns Liu’s trust, Chen Zhen earns the attention and/or suspicion of Kiki (Shu Qi), Casablanca’s star singer/hostess and (Not really a spoiler!) a Japanese spy. Besides speaking questionably coherent Japanese, Kiki works for General Chikaraishi (Ryuichi Kohata of City of Life and Death), the new leader of the Honkou Dojo and one of those bad guys who kills underlings and naysayers without so much as a second thought. Part of Kiki’s job is spying on Qi Tianyuan, but she’s also supposed to shadow potential British rabble-rousers and keep an eye on Vivian (Huo Siyan of My Name is Fame), girlfriend to General Zeng (Shawn Yue), whose existence may or may not cause problems for the Japanese. There’s a laundry list of metaphorical landmines here, among them some tense jockeying between Chinese factions, possible collusion with the Japanese, and a “Death List” issued by the Japanese to rout their enemies. With all these factors in play, how can Chen Zhen and his band of rebels seek justice and do it in a clandestine, secret way? The answer: they can’t, or Andrew Lau and his screenwriters can’t figure out a way to tell that story. There’s political intrigue buried in Legend of the Fist, but that’s just what it is: buried. Despite being overly plotted and full of potent drama, the storyline possesses zero tension, and only serves to clumsily string together action set pieces and manufactured staredowns between underdeveloped characters. Anthony Wong’s Liu Yitian is given inner life by the actor, but the character is underused. Conversely, the bad guys do a lot but aren’t fleshed out besides being evil and/or clichéd. Shu Qi and Huang Bo, as comic relief policeman Inspector Huang, each get their share of screentime, with both performing decently. Still, at this point in her career, Shu Qi is far too good an actress to be working as mere support in Andrew Lau films. Here’s an idea: maybe he can actually hire her as the main star, rather than as support for his usual male leads. This is the wrong film to be asking for a Shu Qi starring role though – after all, it belongs to Donnie Yen and nowadays it’s pretty difficult to steal movies from Don-Don. Yen’s character here is familiar; he’s a righteous, angry, suave, debonair and utterly too-cool-for-school dude with a difficult yet heroic past. This is your standard over-written hero character defined by Donnie Yen’s flamboyant and self-conscious acting. Yen has earned solid acting cred in recent years, but only because he’s been able to find the right role: Ip Man. As the Wing Chun master, Yen was subtle and didn’t actually seem to be acting – something he doesn’t accomplish here. Adding to the familiarity is that Chen Zhen is basically your Bruce Lee fan-fiction creation, meaning nods to Fist of Fury, The Green Hornet (Chen Zhen’s superhero get-up is Kato, natch), plus some Lee-style yelping and yowing. When Yen isn’t aping Lee, he’s usually aping himself, with even some action (e.g. the amazing Donnie wind-up punch) getting recycled. Yen still has many more films coming out, so a greatest hits collection doesn’t seem necessary just yet. Overall, Legend of the Fist is more of the same Don-Don, with his super-coolness magnified by Andrew Lau’s needlessly flashy direction, which turns what should be normal narrative sequences into unnecessary montage. As an empty stylist, Lau is among Hong Kong’s best, but he needs some help (i.e. Infernal Affairs co-director Alan Mak) to put together a real story or characters. They have a good production in place; Legend of the Fist was shot largely on the same impressive set as last year’s Bodyguards and Assassins, and the film certainly looks good. However, the film lacks real drama. Character relationships are explained rather than created, and few people make interesting or dramatic choices. Unlike the seminal Fist of Fury, Chen Zhen isn't a character who changes or grows - here, he’s primed to go into superhero mode from frame one, with his reason for donning a mask little more than convenience. The impetus for Chen Zhen’s crimefighting only exists in the film’s premise, and not inside the actual narrative.